TINGS DEY HAPPEN is in Pidgin English. When I heard Hoyle was going to be performing in Nigeria, at the invitation of the State Department, I decided I had to see the show. More than anything, I was curious to see what Hoyle’s idea of pidgin amounted to. There is so much contrived stuff that passes for Pidgin English in popular culture, that I really didn’t have any significant expectations. By the end of the 75 minute performance, which took place at the heavily guarded American Guest Quarters on the Ikoyi waterfront in Lagos, I was more than impressed. Hoyle’s pidgin is impressive, as authentic (I hesitate to use that word) as it gets. Gangs roam the delta, but in Hoyle’s world, criminal and crude are, quite refreshingly, not synonyms. 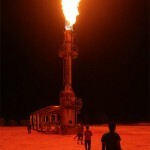 Some of the militants speak good English. They even have a sense of humour. “There’s no sign that says ‘Welcome to Nembe Creek’, ‘cos if you haven’t noticed, you’re not welcome,” Hoyle’s white character is told. Not long after the militants add, perhaps tongue-in-cheek: “We are too intelligent to kidnap you.” Perhaps this is because they know that he is merely an academic, with little potential for generating a decent ransom. 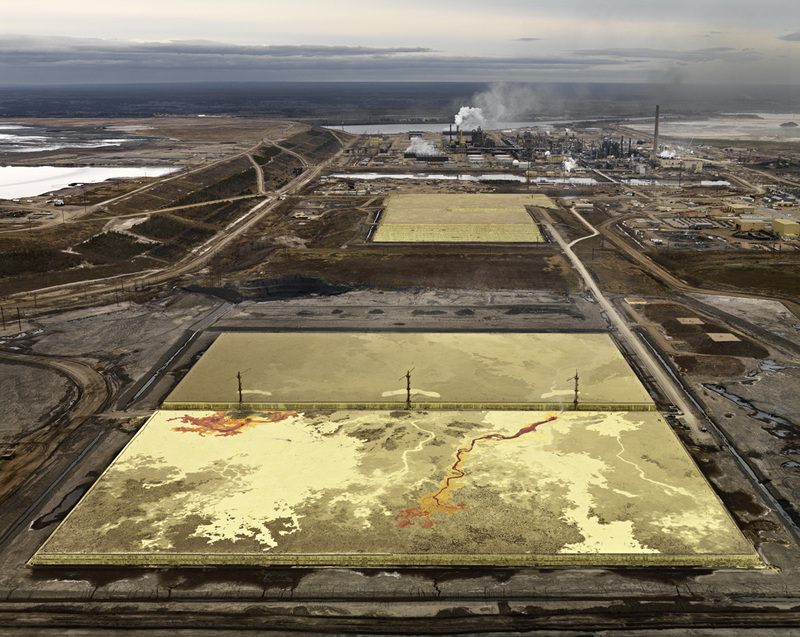 A decade of photographs exploring the impact of oil from the acclaimed Canadian photographer Edward Burtynsky. The collection will be on display at Washington D.C.’s Corcoran Gallery through Dec. 13. “I thought ‘well, this is a highly self-selected group of climate change people’,” he says now. “In the evenings we were discussing how to save the planet, and a few feet away through a bulkhead was this utter chaos! And I thought ‘that’s perfect, that’s the human angle on this that I want’. If one thinks of literature and novels in particular as investigations of human nature, then human nature suddenly became at the centre of our problem about climate change: that we’re sort of cooperative but selfish, we’re not used to thinking in long-term eras beyond our own lifespans or immediate spans of interest. 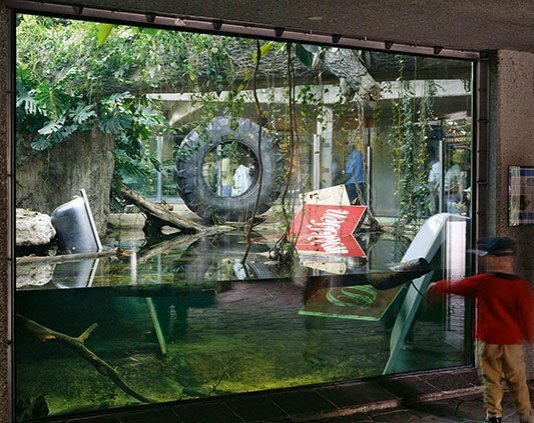 Sculptor Christoph Steinbrener and photographer Reiner Dempf have modified the animal enclosures of the Vienaa Zoo for summer 2009 (June 10 – October 18) for their show Trouble in Paradise. 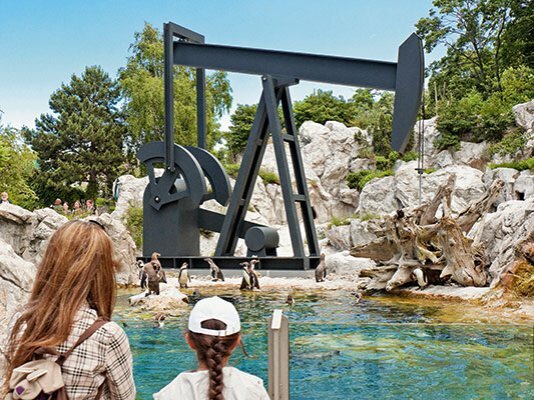 Their show transforms the idealized wild setting in which animals into settings that contain some our activities that are endangering animal populations outside of zoos. 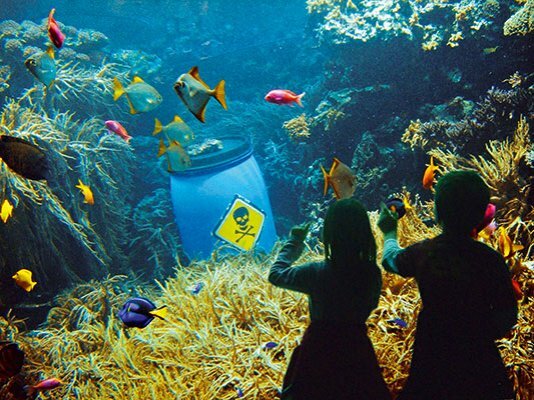 … A sunken car wreck at the rhinos, railroad tracks in the bison pen or toxic waste in the aquarium are unexpectedly interfering with our notions of idyllic wildlife. The viewer is forced to reconsider traditional modes of animal presentation and simultaneously to question the authenticity of concepts which are restaging ‘natural’ environments while they are increasingly endangered. 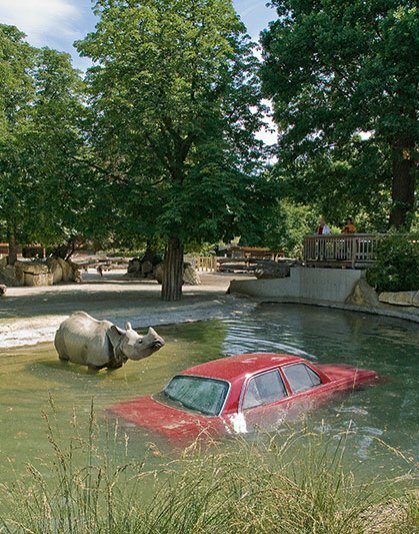 …Present-day conceptions of zoological gardens aim at the presentation of animals in an idyllic and apparently natural environment, untouched by civilization. But this is a contemporary conception, since courtly menageries and kennels were adapted to the exposure of animals as decorative objects. Until the early years of the 20th century, animals were part of a preferably spectacular and exotic staging, to the entertainment and amazement of the public. The artificial and the sensational were foregrounded, without creating a realistic setting of the natural environment of the animals. All photos by Christoph Steinbrener and Rainer Dempf from their webpage. Artists whose work captures some of the complexity of nature. 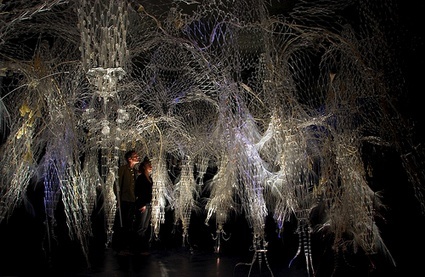 Canadian artist and architect Philip Beesley‘s Hylozoic Soil, an sculpture whose shape memory alloy arms move in response to the movement of people. Reuben Margolin, dynamic wave sculptures. Musician and artist David Byrne is a judge for the bike rack design contest in New York City. The entries were asked to be as creative as possible while recognizing the requirements of “security, ease of installation and maintenance, and efficient use of space”. 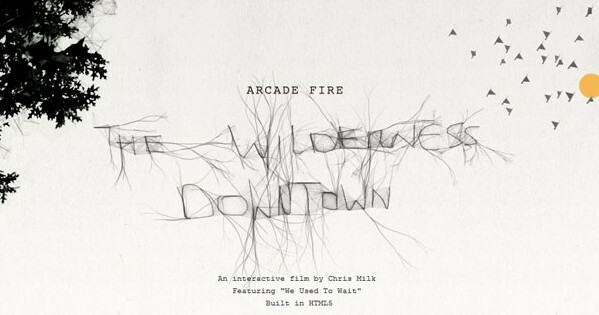 The Wall Street Joournal video to above, shows some racks Byrne was inspired to create himself. More entries are here.